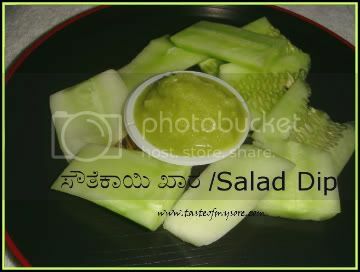 After Chat party, salad dip/cucumber chaat/ಸೌತೆಕಾಯಿ ಖಾರ was in demand among friends. 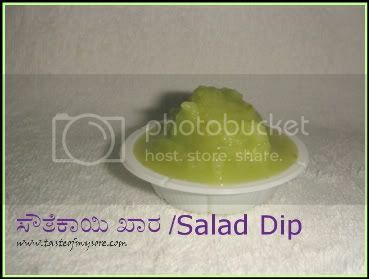 I am posting my recipe for salad dip here. It is very sour& hot, so use it with caution! or adjust green chillies according to your taste. Cut Raw mango into bite size pieces and grind with rest of the ingrediants without adding water in a mixer grinder/blender to a smooth paste. Add salt and sugar to adjust the taste. Serving/Eating Suggestion : Spread the chutney generously over cucumber/carrot or just dip the salad wedges and eat. Akash had taken part in a fancy dress competition (at his school) and he did not get a prize. :( ..poor Akash, forgot to wear his pants..how will the teacher consider him? When asked he said.."oh no..I only wore jacket and the helmet and also I had school shots so did not wear the pants you gave me" .. :( poor me..I had nothing to say except laugh when he was not around.. dare not laugh in front of him, coz he was so upset on not winning. Daddy had made Singapore and India flags and jacket with a backpack for him, mummy and Anupriya aunty had made helmet for him...poor boy he forgot his pants..he was all depressed when he did not see his pic in school news letter so mommy promised him to put up his photo in her website.. :D that was all mommy could do to make him feel happy. We told him winning is not everything in life; participation is most important to learn and develop a winning attitude. It was all Greek and Latin for him. I hope he will understand it as days goes on. we have not posted anyone's name just to play safe. I know many of them have asked for names etc on Priyanka's blog. Just keep guessing ;) Sowmya's cake was awesome and Priyanka's Sandesh was delicious. We had coffee at Toast Box. I have fallen in love with Toast Box's Coffee and all thanks to Priyanka for introducing it. Now I know, you are in the middle with colorful Kurta! Salad looks Awesome....I hope u all foddies have great time..
wow.. superb color.. nice dip..
Yeah itoo tell my daughter it is taking part which is important than winning. Nice combo...We make mango chutney same way exclude just the sugar and mint leaves & super cool mango chutney is ready to eat with anything.. Salad dip sounds too good with raw mangoes and all. 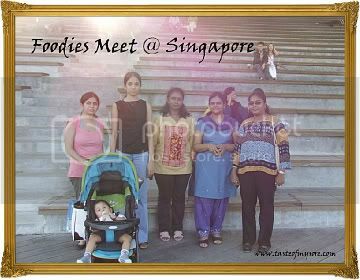 Am sure ur son is happy now looking at his pic in ur blog :)..Totally cool of you guys to have met up and shared thgts and food. Never heard of it sounds interesting nicee.